Pure Water Products offers state-of-the-art AerMax systems with Air Pumps for treatment of iron, manganese and hydrogen sulfide, and we provide a wide variety of parts for these systems on our main website. We also have the simple, inexpensive aeration system described below. These parts fit and interchange with the Nelsen Corporation’s “Terminator” Aeration Systems. Please call for information and pricing on complete Terminator units. In the passive venturi aeration system pictured above, when the well pump is running, water from the well passes through the venturi valve which draws air into the water line. An aeration tank which follows the well’s regular pressure tank provides contact time and mixing space so that the air can oxidize the iron, manganese, or hydrogen sulfide for removal by a filter. (The filter is not shown and is not included in this product. We provide many excellent filters for this purpose on our main website.) The vent valve on top of the aeration tank vents off excess air. 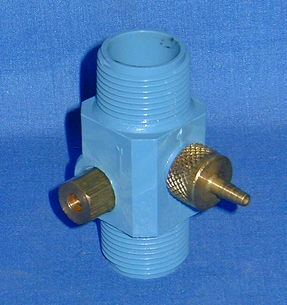 Waterite Venturi Air Injector. Air is drawn into the water stream through the stem on the right. The system can also be used to inject liquids into the water stream by attaching a tube to the barbed stem. The nut on the left provides an adjustment. Honeywell/Braukmann Air Vent, 1/8″. Passive Air Vent without vent tube. This equipment is not yet linked to our shopping cart, but you can order by calling 940 382 3814. Prices on this page include shipping.